If there were ever a brand-reset button in the automotive business, the BMW i3 electric car is it. It's both a compact hatchback and an all-electric car, from the brand that claims to build ultimate driving machines. How does it measure up to that lofty standard? Hi, I’m Joel Feder, and I’ll give you our verdict on the BMW i3 in our latest video road test. Strip away the simulated twin-kidney grills and roundel badges, and you'd really never know the i3 is a BMW. It has skinny tires, and an odd side view with a dipped window line. Inside, it's unlike any BMW you’ve seen before—it’s more like a loft living room than a cockpit. It's dominated by a big screen that displays infotainment functions, controlled via the iDrive knob on the console. A smaller screen behind the steering wheel provides all the other driving information, including the speedometer. Overall the interior is elegant and well put together, except for the renewable-fiber kenaf material. It’s fine on the far part of the dashboard, but the door panels look like they’ve been stripped of their covering. It’s the one sour note in the car. 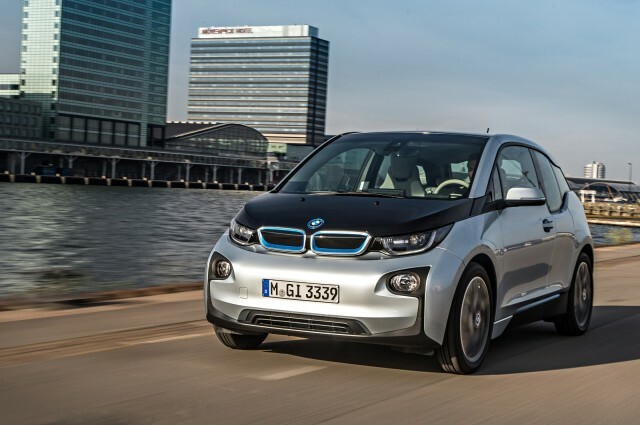 ALSO SEE: Is BMW i3 Electric Car Selling Better In U.S. Than Germany? This interior is far more spacious than you’d think. While the front seats have extremely thin backs, they’re comfortable and bolstered well. The seating position is upright and higher than some other small cars, and you get good view of the road. The rear seats are a bit tight for full-sized adults, and it’s awkward getting in and out because the rear passengers can't open their own doors. The front-seat passenger has to open the front door first. The i3 breaks completely new ground in its drivetrain. It's a battery-powered electric car with a 22-kilowatt-hour lithium-ion battery pack mounted under the floor. That powers a 125-kilowatt (170-horsepower) electric motor in the rear that sends up to 184 pound-feet of torque to the rear wheels. 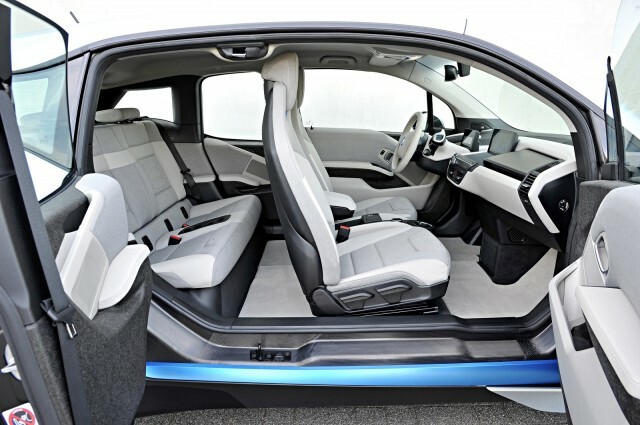 The EPA rates the i3 at 81 miles of electric range with an efficiency rating of 124 MPGe. That makes it the most efficient car of any kind sold in the U.S. today. BMW says you’ll see a real-world range of 75 to 90 miles. Have range anxiety? Want another 80 miles as a safety net (give or take)? You can opt for the range-extending REx engine, as fitted to our test car. It's a little two-cylinder gasoline-powered generator in the rear of the i3, next to the electric motor. It kicks in to act as a generator when you deplete the battery, but it’s not connected to the drive wheels. You should know that opting for the REx model drops your battery range rating to 73 miles--and it’s only rated at 34 mpg while the range extender is on. What’s it like to drive? Prepare to get a lot of stares as you learn a new way to drive. The BMW i3 has superb one-pedal driving, like the old Tesla Roadster. The aggressive regenerative braking is what really sets it apart from any other electric car. It drives small, and has a very controlled ride. That said, it has a somewhat stiff ride thanks to those tall, narrow tires. The instant torque makes the i3 feel quick off the line, but you aren’t going to win too many stoplight wars. The i3 has yet to be crash-tested, and its carbon-fiber reinforced plastic and aluminum platform will break new ground for safety agencies. There are six airbags and the usual array of electronic safety systems. Bluetooth is standard as is dynamic cruise control with braking function. 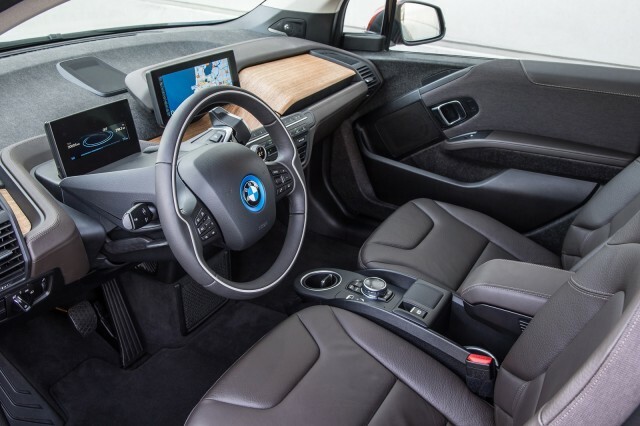 Priced from about $42,000, the i3 comes well equipped, with LED headlights with daytime running lights, navigation and satellite radio, rain-sensing wipers and park distance control in the rear. The only real options are a choice between two trim levels that change the alloy wheels, leather interior bits, and unique interior materials. If you decide to add on the range extender, you’ll spend about $4,000 more.